A couple of months back I was asked by the Swiss Finance Institute to speak about technology and disruption at the 5th Swiss Asset Management Day. Always being keen to talk about the Cloud and its ability to truly transform financial services, I jumped at the chance. The speech went down well, with some people commenting that they didn't realise it was possible to have "compliance as a service." There were a slew of questions at the end, security, being one of the main topics. Having designed Rapptr from the ground up to be as secure as possible and by choosing Amazon AWS (view their security accreditations) as our cloud provider, it was a joy to explain how a cloud service can actually be far more secure than on-premises software. Also read the IDC whitepaper on why the cloud is more secure. I broke out the usual horror stories of cleaning ladies with keys to server rooms and laptops left on trains, which were greeted with a chuckle or two. 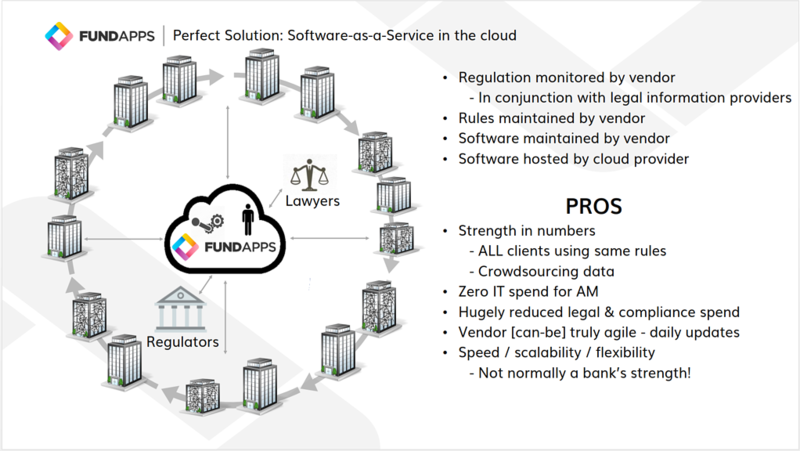 My other key point was that the cloud is the perfect enabler for creating a "Compliance Community" where users can exchange opinions with each other and view feedback which FundApps has received from Allen & Overy and/or regulators. This is one of FundApps' key goals for 2016 to enable this community. If you'd like to find out more about our cloud based compliance services, please get in touch.